I have always had a soft spot for toads. I love amphibians in general, actually; toads in particular. Maybe Beatrix Potter is to blame…or maybe I was just a fearless kid. We found this guy in one of our basement’s window wells today. Tom told me about it, and said we probably shouldn’t tell the kid or she’d have it for a pet. But, well, he told her mother: I would love it for a greenhouse pet! Just think of the slugs this little friend could consume. So I set her/him free in the greenhouse, complete with a couple of clay saucers of water scattered about to drink from. Anyway, I have had toad friends in my gardens every year. Two years ago, that particular friend was huge (the size of a large apple) and I swear I would nearly jump out of my skin when he’d pop through the greenery. This one won’t scare me nearly as much, I think: it’s about the size of a plum. I love toads and frogs, but the guys that really grab my heart are the tiny tree toads…..
Well, it’s the size of a plum NOW. A couple more gobblefuls of slugs, and you might get a big boy. Or girl. the kid with chicks is much cuter! I think a handy toad would be a great addition to the garden too! El: We used to go up to a cabin on a lake in the Adirondack Mountains in NY state for a week every summer and my brother and I would be up at dawn catching frogs and toads in our grey hooded sweatshirts and frayed cut-off jeans. It’s one of my very favorite memories. I read that if they start “chirping” when you pick them up, it is a male. 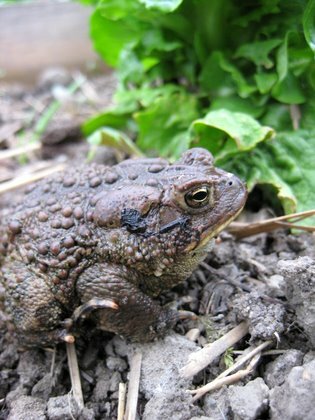 The noise is a defensive mechanism to warn off other male toads and a male territory signal. Kinda like -hey, this my area and you better leave me alone. Females are the more quiet ones, may do a chirp, but most likely to just dribble on ya’. Hayden: it’s always such a happy day when I first hear the frogs in spring! CC: well, yeah, but then I hopefully won’t be finding slugs in my salad spinner. Yuck! Pattie: How fun for you! My husband spent two weeks every summer in the Adirondacks too, how interesting. Lots of great memories all around. Tammie: Animal almanac! Hwah! Yep, I seem to remember the chirping vs. nonchirping. You almost always get peed upon, though! I dug up two red toads when we turned the garden to plant. They were down deep too, probably a foot at least. They were mad, to say the least. One hopped off, one I reburied in the compost pile. I love toads, I have a toad pool for mine, by the back door. I get up in the morning and find one sometimes sitting in the water, hanging out by the back door light. Jules, I have only seen those red ones a couple of times, as they’re pretty rare up here. We have had tree frogs (the gray ones) sit under our porch light perched on a decorative candle lantern below it…what smart little things. They would climb up there nightly and just partake of the bugs bothering the light. Smart little critters. We had a tree frog that lived in our windchimes a couple of years. They hang right by our back porch light. It was funny, you could tell which one he made his home in as it rang funny, like it was full, when you hit the pipe. He’d come out in the evenings, then in the morning, he’d go back into the tube. They are pretty smart, in my opinion!